Glediator's Arena | I like running, photography, technology and baking – this blog is mainly about running. I was the most ready I had ever been for my first half marathon of the year. 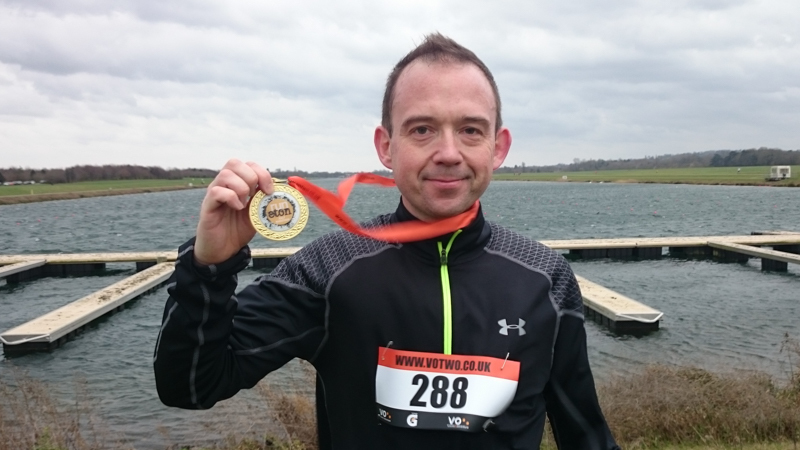 I had run the distance several times over the past few weeks on the treadmill and local training runs, run around Dorney lake twice recently already, and had set several fast times in training over half marathon, one hour and ten kilometres. 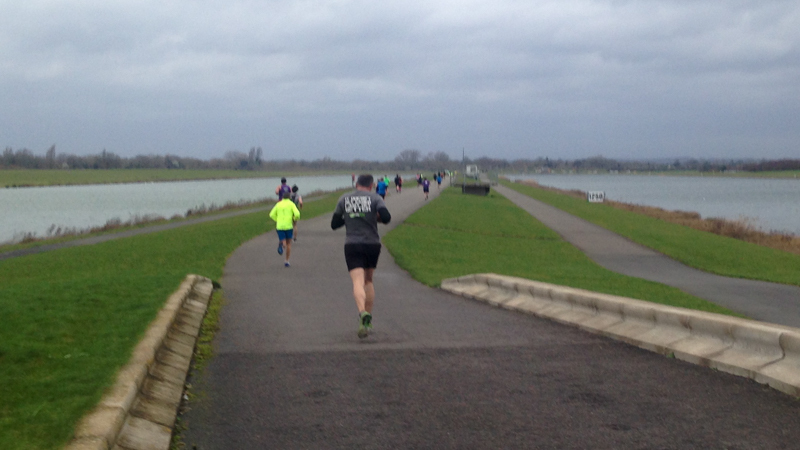 Dorney Lake is a flat venue and so ideal for a race personal best, but also it is very exposed and the cross-winds can be a challenge. Add a few Met Office weather warnings and a storm covering the length of the country, and it was a challenge. The race was right on the edge of the storm but we still felt the effects. The race consisted of four laps and the first part of the lap was directly into a headwind – it was so tough and I felt like I was pushing twice as hard just to move forward at a quarter of the pace. On the first lap it wasn’t too bad as everyone was close together but on subsequent laps turning the corner was like running into a brick wall. The next two kilometres were sheltered and so were very easy to run, but the run back along the lake to the end of the lap was so difficult. The crosswinds meant that we had to run at an angle to go in a straight line, the swirling winds made it was very difficult to breathe, and we were buffeted and thrown in all directions. The race itself was quite difficult to get into initially. The parking was over a mile from the race headquarters and so I arrived at the start flustered and unprepared, and it took a couple of laps to really get into a rhythm. I now understand the need to focus before a race, think through the race plan, and be ready to get straight in. Also there were very few people of my own pace around me and very quickly I was running on my own. 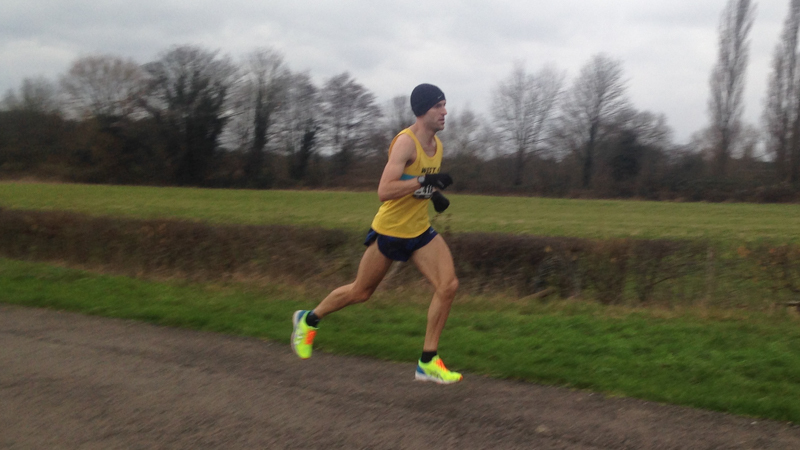 I prefer not to run against a timing app as I want to be able feel the pace I am running and to improve my natural race pace over time, and this was a good opportunity to just get my head down and focus on race pace. Given the challenging conditions, the sudden start, and the spread out field of runners, I had worked out very quickly that I was not going to set a personal best time. I was on for 100 minutes and so worked hard to stay under that, which I managed by crossing the line in a little over one hour and thirty-nine minutes. I was in some pain soon after the race and also the following morning because running against the wind had put extra strain on my legs. I normally train on a treadmill or in a local park and so weather is not normally a problem, however I am also using local races to train for the bigger races and so this experience will help. This entry was posted in General on 7th February 2016 by glediator_blog. 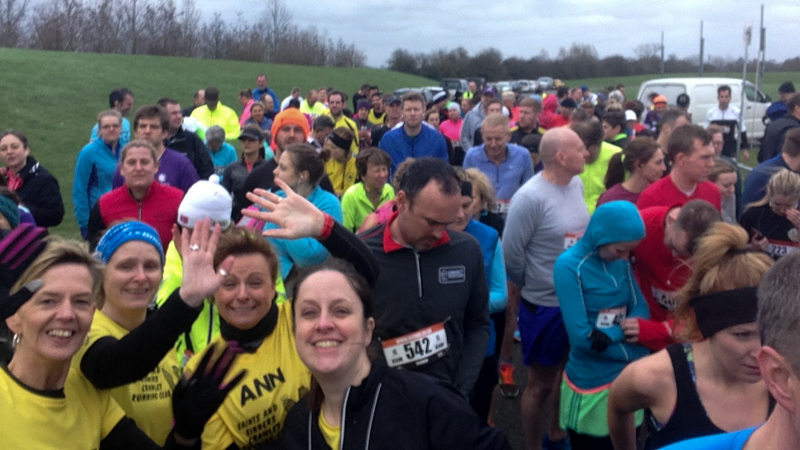 The Silverstone Half Marathon is many things – it is a warm-up race for the London Marathon, it is a chance to dress up for charity, it is a potential personal best, it is an ideal first race. Today several thousand people descended on the circuit with a whole range of goals and outfits. For me the race is a chance to run around a historic venue – one that I have been to many times as a motorsport spectator and photographer – and also to check out how my early season training has been going before the city-based half marathons I take part in later in the year. This is the fourth time I have entered the race and it is always an extremely well-organised event. The instructions are clear, there are sign-posts everywhere, there is trackside commentary with full instructions, and there plenty of medical staff and drinks stations. I picked my place just in front of the 1h 30min pacer and the race started promptly at 12noon (and quite suddenly – there wasn’t a grand countdown or anything this year as the commentator was still trying to encourage people to get to the assembly area as quickly as possible). The exist of Copse was lined with spectators who were cheering on their runners before we disappeared off into the distance. The elite runners were first, followed by us not-quite-so-elite runners, and then all sorts of fancy costumes and outfits filtered past. I take part in a lot of races but the sound of several thousand runners all pounding the track through Beckets corner in one big bunch on the first lap is a totally unique experience. The only sound is of running shoe against tarmac – no background noise, no spectators, nothing else. The first lap went really well and I was just about maintaining the 7.5 minutes per mile pace that I was intending to keep. The run along Hanger Straight, the new pit straight, the Wellington Straight, Luffield, etc, all went fine and I was able to push hard and even overtake a few people. The second lap is around the infield of the circuit and I started to struggle a bit here as my pace tailed off to up to 8 minutes per mile. I could push occasionally but couldn’t consistently keep up my pace from before. This infield lap is quite flat though so I tried to not lose to much time. The third lap of the circuit is around the perimeter of the circuit in an anti-clockwise direction. This is motivating, as it is beyond the halfway point, but also tough as at my pace the leaders ran past along the Hanger Straight on their final lap whereas I still had a lap to go. The spectators this year were amazing. The second lap at the entrance to the infield, by the bridge over the Wellington Straight, the third lap behind the old pit straight, and the first and fourth laps at Luffield, were all several rows deep and full of people waving and high-fiving. The choice of music this year was interesting. The DJ often allowed runners to choose tracks by raising one arm for option A or two arms for option B, but sometimes the choice was along the lines of Ready To Rhumble by Ant and Dec or Dancing Queen by ABBA! The final lap, along the old circuit through Bridge before rejoining at the new pit straight, was tough as the hills seemed a lot steeper than before. There were also grey clouds and a brief touch of rain as we passed though Vale but fortunately the bad weather was very local. I pushed hard over the final mile and finished in a time of around 1 hour 47 minutes. I had really wanted to finish in under 1 hour 40 minutes but I had pushed as hard as I could, I wasn’t in any pain, and occasionally hit my target pace, so I was happy with this performance. We waited behind for a few minutes to watch other people in their costumes – the Indians in their canoe, Andy’s Toy Story box, a Minion, a fireman, Thor, a Spiderman, a giant Wellchild, and a walking dinosaur, all stood out not just for their outfits but also their efforts. This entry was posted in General on 15th March 2015 by glediator_blog. The opportunity to run around Brands Hatch Grand Prix circuit is something that most local running and motorsport enthusiasts should jump at. The moment I saw the inaugural British Heart Foundation Brands Hatch Half Marathon I signed up. I knew it would be no easy run, and definitely not a Personal Best, but having watched hundreds of car races around the circuit over the years I had to take part. The circuit itself was a joy to run on. The track is very springy and so is easy on the feet and the knees, and I know what most corners look like from taking photographs trackside but the view was even more stunning from in the middle of the corners. The course was anti-clockwise, so against the normal direction of races (although the same direction as the cars original raced in the early 1930s). The race itself was tough. It was very hilly, very windy, and the off-circuit sections were very muddy. There was definitely something for everyone and the field oscillated around as different people took to their favourite combination of conditions as and when things changed. The track itself was hilly, the off-circuit sections were muddy, and the wind battered the runners hard everywhere else. I got caught out at the start by the camber on the pit straight. I always thought it looked perfectly flat on television and from trackside but as the race started I found myself sliding to the left as the banking caught me out. Also many of the corners were a lot steeper than I was expecting – the climb through Clarke Curve, the dip in the middle of Stirlings, and the climb to Westfield, were all a surprise. The run up to Druids from Graham Hill Bend was my favourite section of the whole course. It was steep, but the kink on the exit of Druids made a really nice picture, and we were running into the sun so there were the shadows of the trees and the shadows of the runners all reaching out. The exit of Druids was daunting as you could see Paddock Hill Bend approaching but that was nowhere near as tough as I was expecting. The race had the full range of runners, from those who sprinted off into the distance in the first few hundred metres, to many half marathon regulars like myself, and then those who were taking part because this is a charity event and were giving it their all. The event was a joint 10k and half marathon so it was difficult to tell who was on what lap and was in each race, but we just got on with it. The spectators were allowed to roam free and, although many of them stayed along the Brabham Straight or on the approach to Graham Hill Bend, a few ventured out too further parts of the circuit. Many spectators were encouraging on the runners and also the runners themselves were very well-mannered and thanking the spectators as they passed by. A runner will always appreciate any shout of encouragement. I started to hit the wall after about 12 miles and so the final lap of the Indy circuit was tough, particularly towards the end with a final climb up Paddock Hill Bend, and my feet were really hurting. It really helped to have a good knowledge of the circuit though as I knew exactly what was coming up and where I could push and where I would need to back off. I got a text message soon after crossing the finish line saying that my time was 1 hour 52 minutes 57 seconds. This was a nice surprise – I had been hoping for 1 hour 45 minutes, and early on I was on course for that time, but during the second half of the race I really struggled with the wind and knew my pace had dropped off slightly, so was very happy to still be well under two hours. I would happily do this event again. It was a well-organised event, there was lots of information on the day and it was clear what we should be doing, and the spectators and the supporters all very much got into the occasion. And then there was the opportunity for hot food, and a pint for those who really needed one, in the Kentagon restaurant afterwards. This entry was posted in General on 1st March 2015 by glediator_blog. The Torbay Half Marathon is one of the largest running events in the South West and I entered the race for the third time this year. This race didn’t go to plan but I learned a huge amount from the experience and was still reasonably happy with my result. The course is very challenging as there are many turns and hills. I prepared for this race by doing a number of 10k races to work on pace and general fitness, two half marathons to get used to the distance, and several races around Richmond Park to get used to the hills. Unfortunately my preparations for the race were affected by several challenging days at work which left me run down, and a cold and cough being passed around the office which I subsequently picked up, so I missed the two final days of training that I had planned. I took all sorts of pills and potions in the three days before the race and on the day itself felt just about okay and well enough to give it a go, but was fully prepared to back off or drop out if needed. This was the first time I had started a race not feeling 100%. The warm-up went fine and I actually felt in really good shape. The first mile was a strange experience though as I felt a bit light-headed but I took it easy and settled down into a comfortable pace. I decided at this point that my goal was to just complete the race. In the early stages I actually felt really strong and I was able to run at whatever pace I wanted to. I decided to push hard on downhill segments and reasonably hard the rest of the time, at around 90%, and see how the race panned out. I’d worked out early on that I was on course for a 1 hour 38 minute finish, which was a bit disappointing (I want to get under 90 minutes at least once this year) but a reasonable target. Perhaps I could gain back a minute or two here and there. The first lap of the course went pretty much perfectly to be honest. I could run at whatever pace I wanted, I felt fine, my left ankle had a slight niggle at 2 miles but that soon cleared up, and everything was going well. I was slightly hot because of the sun, but doing okay. At the start of the second lap I realised I had overheated slightly during the first lap, a situation made worse as the temperature suddenly cooled and then I picked up a slight chill too. Also my legs started to seize up and I started to feel a bit drained and wobbly. Everything had suddenly gone wrong, and so my goal was now just to finish the race. Forget about times, pace, averages, etc. I had a good first lap, be happy with that. I just need to finish the second lap – by walking if necessary – and get that T-shirt and medal at the end. The second lap was torture. Every step was painful, and more and more people ran past me as my pace tailed off. The hills were like hurdles, the flat sections seemed ten times longer than they actually were, and the downhill sections brought no benefit like before. I didn’t feel any chest pains and I was only slightly wobbly so I decided to continue – if either of those had got worse then I would have stopped in an instant – and was now actually running only one minute per kilometre slower than the first lap. Not as bad as it felt. The last 800 metres felt like three miles and the last 400 metres felt like two of those miles. I picked up my pace on the home straight as I wanted to be sure to finished under 1 hour 45 minutes, which I achieved with a few seconds to spare. I learned to never run a half marathon if not feeling 100%. I have got away with doing a 10k race with a heavy hangover before but a half marathon is a very serious distance and, especially in high temperatures, you have to be really careful. It was a great race through – extremely well organised, everyone seemed to enjoy it, the classic rock singer and guitar duet were a hit as always, the brass band outside the theatre was very motivating, and all the crowds offering Jelly Babies was a really nice touch. I wasn’t totally convinced by the yellow technical event T-shirt – it makes me look like a Colombian midfielder – but I have been advised that it does work, and the medallions we were given at the end are impressive. I look forward to next year! This entry was posted in General on 1st July 2014 by glediator_blog. The annual Havens Hospices Southend Half Marathon is one of the most enjoyable races of the year. It is a very well organised event, with thousands of spectators lining the route, and has a very flat and scenic course along the seafront at Shoebury. This year nearly three thousand runners entered the race and those taking part assembled at East Beach on the morning of Sunday 8th June. It was a very warm day and the organisers were very careful to advise us just to enjoy the event, not to attempt a Personal Best time in the conditions, and also to take on lots of fluids. The start was chaotic because the pre-race warm-up took place just to the left of the starting area – this caused the whole area to become congested and resulted in lots of slower runners starting out of position near the front, which was particularly awkward as the first few kilometres are very twisty and there were many close calls before the field spread out. I quickly settled into a comfortable rhythm and worked my way up through the field until I was surrounded by a group of runners who were running near my target pace. The conditions were a lot warmer than I was used to in training so I took on regularly small amounts of water and didn’t push too hard too soon. There were water stations throughout the course with each station manned by a number of keen and helpful volunteers, some with plastic cups of water and others with soaking sponges, and there was water for everyone who needed it and no issues with access to the stations or congestion at them. I have run a lot of half marathons, both in races and in training, and so am mentally well prepared for the distance and know how to break it down. Also this was my third Southend Half Marathon so I am now very familiar with the route, hence it was quite easy to pace myself, stay in control, and conserve energy for when I needed it most. Early on there was an ambulance driving slowly back along the seafront towards the start and so I assumed that someone had suffered from the heat in the first few miles. I have never seen medical attention so early in the race and so was aware that other people might be finding the conditions challenging. As a runner you always appreciate every shout of encouragement from spectators and this event felt like it had most of the local population standing by the road, or standing on their balconies, cheering us all on. I always try to acknowledge anyone who encounrages us on but it is not always possible at this event due the number of spectators. I knew that I was just starting to fade at about halfway but decided to just run at the pace I was able to, with occasional short bursts of energy, to see how things went. I had worked out very early on that a Personal Best was out of the question but I still wanted a respectable time and wanted to push myself a bit as more races are coming up soon. The second lap of the sea front felt tough because of the conditions but I knew there was now less than 10 kilometres to go and that is a distance I know very well and complete regularly without any problems. I tried to maintain a good rhythm and run at a steady pace. The closing stages of the race are challenging because the road away from the sea front is a sudden steep climb and then the final kilometre back to the finish is always far longer than you think it is. I really focussed hard on rhythm, pace, and being mentally strong and in control – I didn’t want to fade towards the end. Shortly before the finish a medic was rushing against the flow to get to a runner who had collapsed and was described by one of the volunteers as ‘delirious’. There were also several faster people who were now walking to the finish as they were unable to run any further and so it was clear that some people were really suffering. I completed the distance in a chip time of 1 hour 37 minutes and 44 seconds. I was slightly disappointed because I was four minutes away from a Personal Best, two minutes away from last year’s time, and six seconds away from my best time of the year, but had finished in under 100 minutes and so was happy. As I crossed the line I was struck by the heat and suddenly felt very dizzy and wobbly. I looked around for some water but the marshals advised that it was several metres away in one of the tents – this seemed sensible as it avoided congestion, although I really was quite in need of some water there and then! Within about five minutes I had warmed down and recovered enough to head home so we decided to leave before the car park became too congested. More and more runners were finishing the race and I couldn’t see any car park marshals around to help people leave. I saw rumours on Twitter soon afterwards about an incident at the finish line and a few hours later was sad to see the news that someone had made it to the finish but no further. I don’t know what happened or the circumstances around it so cannot comment or speculate. The event was extremely well marshalled though, the runners were well watered, the local residents were out in force as always, and it was a very enjoyable race to take part in. Also it was good preparation for the Torbay Half Marathon later this month and I know what I need to work on over the next three weeks. This entry was posted in General on 9th June 2014 by glediator_blog.